A few days ago I visited Michael Dashe from Dashe Cellars. 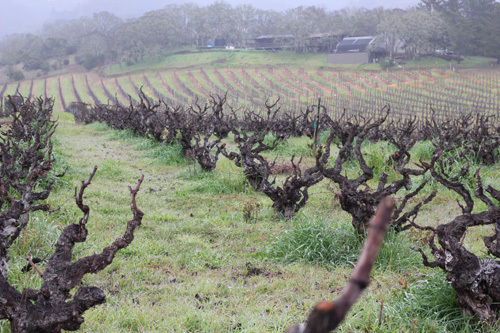 We had plans to have the interview in the middle of their wonderful Louvau vineyard in Dry Creek, but unfortunately, it was raining by the time we got there. So instead I quickly took a few pictures between the drops and we postponed the interview until later. Back at the winery, I had the privilege to taste their Zin from the McFadden vineyard 2010, only 3 days after bottling! Fresh, light, clearly acid, and with an pleasant grenadine finish. Delicious, and certainly a good candidate to accompany a salad dish on the summer terrace. After lunch, we tried to get rid of just every sound as possible: we closed one of the garage doors facing the street, we sent some of the rat cellars staff for a break, and we requested the loud pump from the neighbor winery to be moved further away. After disturbing virtually everyone in our sight with our low noise level requirements, we finally did the interview. Here is an excerpt of it, where Michael Dashe talks about the future of natural wine. Thanks Michael for such a great day! This entry was posted in interview, winery. Bookmark the permalink. The delicious wine you tasted just three days after bottling was made from grapes grown organically at McFadden Farm in Mendocino County’s Potter Valley. Guinness McFadden has been growing organically for over 40 years; not just grapes that end up in the wines of Dashe cellars, Sterling, and Chateau Montelena, as well as our own wines available for tasting at our Hopland tasting room at no charge, but organic herbs, garlic, wild rice, and grass fed beef. We at McFadden Farm love what Dashe Cellars does with our organically grown grapes from McFadden Farm, which should not be confused with the grapes that come from a tiny Napa parcel called McFadden Vineyard.